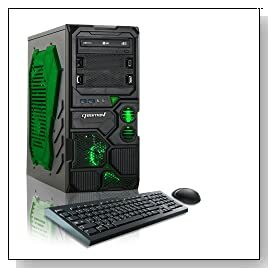 CybertronPC Borg-Q GM4213B is a gaming desktop with a fast AMD FX-4130 processor, 450 watt power supply, 8GB memory, 1 TB hard drive, NVIDIA GT610 graphics card for good gaming performance, solid build and nice looks with its LED lights inside. When you see how much it costs, you may wonder why but there is nothing to worry about, it is a very decent gaming desktop. CybertronPC Borg comes with a powerful quad-core AMD FX-4130 processor at 3.80GHz speed with AMD 760G Chipset to handle most of the advanced games, a generous 8GB DDR3 memory for lots of multitasking (it is easy to add extra memory), massive 1TB Serial ATA-300 hard drive at fast 7200 rpm rotating speed to store your games, movies, songs and photos and 64-bit Windows 8.1 operating system. The system provides great visuals when you're playing games, watching movies or working on your other multimedia tasks with also its NVIDIA GeForce GT610 graphics card with 1 GB graphics memory. The GT610 is not the most powerful graphics card for gaming and it is designed to handle medium range games. If you want something like NVIDIA GTX, you need to spend around $100 more on the card, the GT610 is just fine for what you are paying for this PC. You can play games like Minecraft and Farming Sim 2013 at higher settings easily. But the picture quality is very good with clear images, accurate and vibrant colors and if you want an even better graphics performance, the card is not difficult to replace at all. CybertronPC presents a solid and stable platform for multimedia, games and daily computing. CybertronPC Borg weighs 27 pounds and has the measurements of 19.50 x 7.75 x 17.50 inches. The case looks nice and current, with also the LED lights but not sure if that would be consuming extra power. It comes with lots of ventilation (there is also a fan on the side) so dust may be a bit of a problem by time but you can easily open it up and the internal components are nicely organized. It comes with a Logitech keyboard and mouse that you see on the photo- no surprises! Some of its connectivity options are: 24X DVD±RW Dual-Layer Drive optical drive, Gigabit Ethernet 10/100/1000 with an RJ-45, 7.1 Channel Audio, 1 x VGA port, 1 x HDMI port, 4 x USB 3.0 ports, 4x USB 2.0 ports, 1 x DVI, 3 expansion slot (2 of them free), keyboard and mouse.. For wireless connection, you need to get a 300 MB/S wireless adaptor (costs about $10) and a Bluetooth USB dongle to wirelessly connect to other Bluetooth enabled devices (costs a few dollars). Conclusion: CybertronPC Borg-Q GM4123B is a fast and powerful gaming desktop with specs and features a bit beyond its price tag. It has a sturdy build despite having a plastic case, looks nice with the LED lights, has a fast processor along with large amounts of memory and storage space. Case being easy to open and parts nicely organised, you can upgrade it conveniently. It is fine as it is but if you want to get better gaming performance, upgrade it to a better video card (should cost between $100-$200). You have 12 months parts and labor warranty and lifetime technical support if you experience any problems.